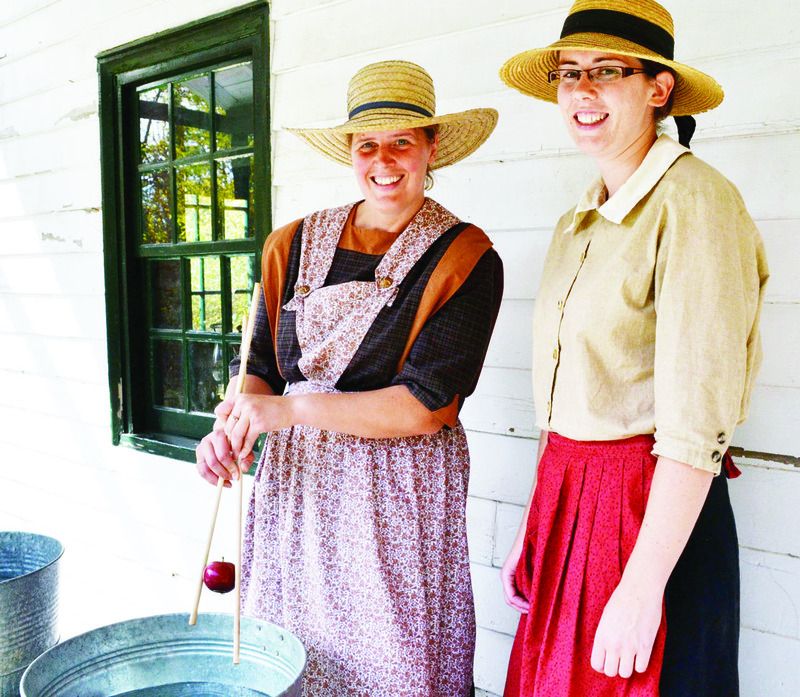 The Doon Heritage Village is a place where people can relive the times of simplicity and hard work. On the day of fall harvesting, the orange, chestnut brown and reddish leaves are crisp and emit a loud crunch as visitors walk on them. The jingle of bells and clatter of horses’ hooves signal their approach to the Martin House where visitors could explore the wonder of apples. The smells of fire and sweetness fills each room as women prepare for fall harvest by stirring a pot of apple butter and peeling and cutting apples for schnitzing, also known as the drying of apples, German style. A cheap, economical way of making money, apples are a sweet source of revenue for early settlers, with most farmers having a small orchard on their land. At the turn of the century, the demands for apples started to increase internationally, so schnitzing is a perfect way to preserve apples so they would not spoil. On a perfect Monday afternoon you can find children grinding windfall apples in order to produce apple cider which is demonstrated at the Sararas-Bricker farm. Apples that fell off the tree, either bruised or a little bit wormy, are made into cider. Crank, crank, crank. In the meantime, the smell of apple pie and German apple pie (which has raisins) wafts through the air, tantalizing visitors as they walk along a leaf-covered path to the Seibert House. They are greeted by a beautiful garden and a white delicate gate as they enter the typical home of a successful tradesman, small business owner or clergy. In the room on the left is a phonograph laid upon a cloth-covered table with 11 photos of families, homes and rivers. Around the corner is a dining room with writings that cover the entire table and a kitchen that is regularly used to make many great and delicious meals and desserts. Just like the horse wagon ride that is provided, people would travel for kilometres by horse and buggy, and by 1914, even by train, in order to buy items as small as a needle to as large as a stick of wood. The old-fashioned phone, icebox, accounting equipment and electricity are a means of competing with other general stores. “The electric lights kept the business running because farmers would work until it was dark, so they would be able to come in and do some shopping. It was also kind of like a hangout on Saturday night because they sold ice cream and would stay open until 12 a.m. It would be just like a party,” he said. Cash, credit or produce were taken in exchange for goods which was an advantage because other competitors would only accept cash. In a timely manner, visitors walk past children on wooden stilts and playing other traditional outdoor games outside the McArthur House on their way to the meat market, which is newly built. People would come to the market every second or third day to get small cuts of meat. The larger cuts would be cut in the back behind a door or a sheet which divides the store front which is filled with weights and hanging meats from the meat curing and processing area.Diagonally across from the meat market is a blacksmith shop. In a village this size, one blacksmith is sufficient. From fixing farm implements to the placement of horseshoes on horses’ hooves, blacksmiths are very important to a small community during this time. Ting, ting, ting went metal on metal as Berardi stroked the hot horseshoe on his anvil, shaping it to fit a horse’s hoof. Farmers could bring their horse to the blacksmith shop which is filled with coal and ashes in order for the horseshoes to be custom made. “The farmer would bring his horse inside the shop and the bars on all the windows were to prevent the horses from smashing their heads through the windows. They take down the size of horseshoe they thought would fit best, compare it to the hoof, memorize the changes that would have to be made and make them,” he said. By the time the horseshoe is ready, the horses’ hoof is cut back and filed down so all that needs to be done is the placement and nailing of the horseshoe. The smell of burning hooves and smoke produced from the horses’ hooves would have probably made anyone sick to their stomach said Berardi. Like many of the shops at the turn of the century, blacksmiths usually just accepted cash, but they could also accept credit. Another important store, located near the printing office, harness maker shop and blacksmith shop, the tailor and post office which supplies men with their fashions. A homemade suit costs roughly between $25 and $40, which is extremely expensive when people are only making a dollar a day. To increase business the tailor sold items such as shirts, collars, hats and underwear. Over in the next room is the post office where friends and relatives would pick up their mail every day. Since the tailor is located beside the post office, he is lucky because now he is able to bring in more profit for his business, said Tofflemire. Other attractions in the village include a railway station, a weavery, a park, a sawmill, a repair shop, a freeport church and a fire hall, all within walking distance from each other. It was at these crossroads where small villagers like this one became the developing points for seasonal activities for farmers and surrounding areas. Newspapers, electricity, steam and telephones were changing the way the villages lived. Because of the changes at this time, the turn of the century became a period where the outside world was no longer a foreign place.